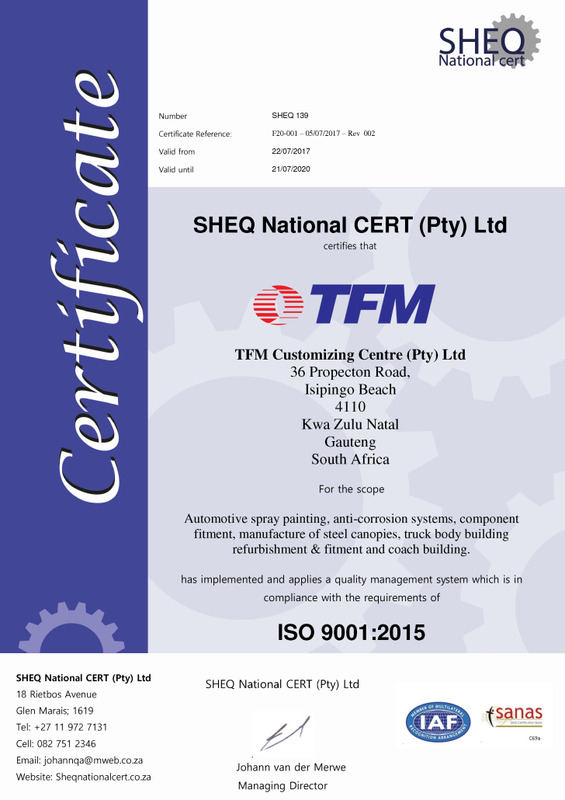 TFM Customising Centre, based in Prospecton, Durban, was previously certified ISO 9001:2008. In 2017 it is still voluntary to move across to ISO 9001:2015 but TFM CC decided to embrace the opportunity for continuous improvement and get ahead of many of its competitors by requesting for re-certification against ISO 9001:2015 this year. From 2018 this process will no longer be optional. The audit was a full 3-day process or “re-certification” audit as opposed to the less complex annual “Surveillance” audit. Between 19 and 21 July 2017 SHEQ National CERT went through TFM CC’s processes and systems and in the end concluded that the company was compliant to the new standard. In accordance with this decision the certification was issued. The 2015 version of the standard is quite different to the old 2008 version, containing strong elements of the TS16949 standard often utilised by automotive companies. This re-certification initiative was driven by Ritam Holdings, led by CEO and Chairman Mcebisi Mlonzi, who recently acquired a 63.75% shareholding in the TFM group and as such increasing the overall black ownership in the group from 27.3% to approximately 87.66%. Mcebisi Mlonzi, commenting, “We look forward to our next 50 years with TFM, developing a world-leading African industrial manufacturing player”. The combination of TFM’s leading manufacturing and product support abilities in all its targeted sectors, will with Ritam, create a competitive platform to deliver a full service offering of specialist vehicles and their maintenance to customers in the automotive, construction, waste, mining, policing, military and defence sectors. TFM Customising Centre looks forward to further strengthening its customer relationships, and attracting new customers who are given a level of confidence in our quality focus, based on our achievement of this standard.